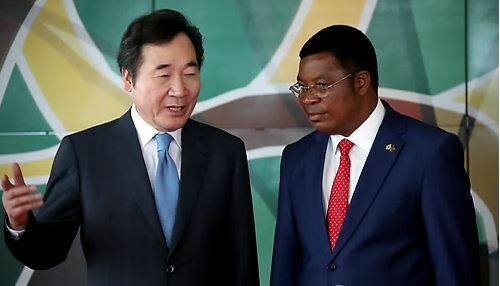 DAR ES SALAAM -- South Korean Prime Minister Lee Nak-yon held talks with his Tanzanian counterpart and agreed to work together to further deepen economic cooperation between the two countries, officials said. Lee arrived in Tanzania on Saturday for a three-day visit in the second stop of his weeklong trip to the region that already took him to Kenya and will also include a visit to Oman later this week. Bolstering economic and business ties with the countries is a key purpose of the trip. In Sunday's talks, Tanzanian Prime Minister Kassim Majaliwa expressed gratitude for the official development assistance South Korea has provided the African nation in such areas as healthcare, education and energy. He also expressed hope for expanding cooperation with the South as it pushes forward with its national development strategy. Lee said that Seoul is committed to continuing development assistance with Tanzania, noting that it is South Korea's biggest development cooperation partner in Africa. Lee also asked Tanzania's government to provide support for Korean firms trying to take part in railway and bridge construction, power grid and other infrastructure projects. South Korea has so far provided Tanzania with a total of US$440 million in grants and loans. That represents the biggest amount of assistance that the South has provided to an African nation, and the ninth-biggest aid among all aid recipients. Lee also called for early conclusion of double taxation prevention and investment guarantee treaties to lay the groundwork for greater trade and investment between the two countries. He also asked Tanzania to pay greater attention to the safety of South Koreans working in the country. Majaliwa praised South Korea's efforts to bring permanent peace on the Korean Peninsula, and Lee asked for Tanzania's continued support for Seoul's initiative to realize peace and denuclearization of the peninsula, officials said.